BA senior’s summer internship provides an opportunity to present trophies for the record-breaking 69th annual ceremony. Sidne Phillips next to an Emmys statue from the evening on Sept. 17 at Microsoft Theater. Not many students can say they’ve had the chance to share the stage with dozens of A-list artists in one night, but Sidne Phillips can. 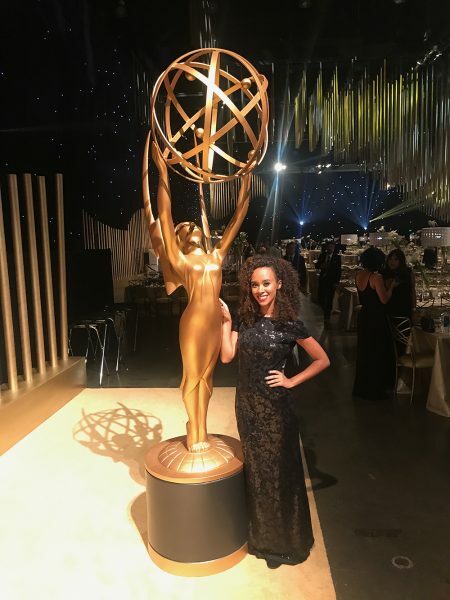 The BA senior was one of four trophy presenters for the 69th Primetime Emmy Awards, a unique opportunity that culminated from an internship she learned about from SDA. Her road to the broadcast began earlier this year, after receiving an email from SDA internships and special programs director Meghan Laughlin, informing students of the opportunity. The Television Academy Foundation’s Internship Program provides over 50 internships to college students in varying capacities — from PR to directing, casting to design — at television studios throughout Los Angeles. This year, four of the students accepted to this highly competitive program were from USC, and two were from the School of Dramatic Arts. Phillips interned with ABC Studios in its development department. Television development is, in Phillips’ words, “the middleman between the creators and the executives of the network,” and the vast majority of her daily duties involved writing coverage (essentially detailed evaluations) of scripts for both new and existing programs. She also attended development meetings in which storylines for different projects were workshopped and tweaked over the course of what Phillips describes as creative banter between like-minded innovators. She finished the summer with invaluable experience, but ready for a refreshed and invigorated kick start to her senior year. However, it turned out that the Television Academy wasn’t quite done with her yet. She received an email from the head of the foundation, Nancy Robinson, explaining that she had been chosen as one of four interns to present the trophies at the Emmy Awards, a move which broke Academy tradition of hiring outside talent to model the trophies during the broadcast. Phillips with the three other Emmy presenters. She presented eight trophies throughout the historic evening. She even “burst into tears” when Lena Waithe of Netflix’s Master of None made history as the first black woman (and the first black lesbian) to win the Emmy for Outstanding Writing in a Comedy Series (which she shared with the show’s creator Aziz Ansari). What made the night so memorable for Phillips was to know that the glitz and glam of the Emmy Awards is really just representative of the culmination of all the different parts of the entertainment machine coming together in celebration. And best of all, Phillips is aware that none of it would be possible without every single person she met during her internship. “There are thousands and thousands of people on that lot doing their part to make the clock work. … There are all these floors, literally floors, of different individual jobs, and it all culminates into Scandal or How to Get Away. … You don’t think about it, you just see the actors, the list of names, but it’s so much more than that,” she said. Oprah Winfrey announcing the last award of the night with Phillips presenting the Emmy. On the Friday before the ceremony, she and her colleagues arrived at the Microsoft Theater in downtown Los Angeles, were shown their dressing room, tried on their outfits for the evening, took a tour of the stage and were debriefed on their responsibilities. During a break, Phillips hustled back to campus for class, then back to the awards venue in time for more rehearsal, which continued into Saturday.